Victor Gazaway Willis (April 12, 1876 – August 3, 1947) was an American Major League Baseball pitcher during the 1890s and 1900s. In 14 seasons in the National League (NL), he pitched for the Boston Beaneaters, Pittsburg Pirates, and St. Louis Cardinals. In 513 career games, Willis pitched 3,996 innings and posted a win–loss record of 249–205, with 388 complete games, 50 shutouts, and a 2.63 earned run average (ERA). Nicknamed the "Delaware Peach", he was inducted into the Baseball Hall of Fame in 1995. Willis was born on April 12, 1876 in Cecil County, Maryland. He moved to Newark, Delaware as a young boy, where he attended school. He attended high school at Newark Academy, and played both on the high school baseball team and in semi-pro baseball leagues throughout Delaware. 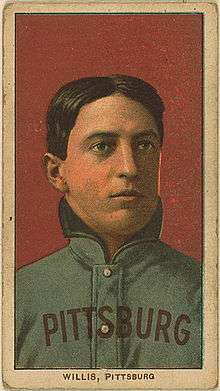 Prior to joining the major leagues, Willis played the 1897 season at the University of Delaware (then known as Delaware College), and later coached the 1907 team and parts of the 1908 team. Over a 13-year career, Willis played for three teams, the Boston Beaneaters (1898–1905), Pittsburg Pirates (1906–1909) and St. Louis Cardinals (1910), compiling a 249–205 record with a 2.63 ERA. He was known as a workhorse and completed 388 of his 471 starts. Willis also holds the post-1900 record for complete games (45, in 1902) in a single season. 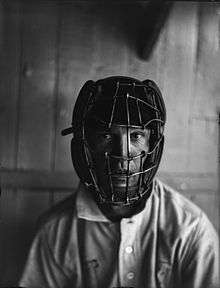 Willis wearing a catcher's mask, circa 1900. Despite being a Hall of Fame pitcher, Willis holds the post-1900 record for most losses in a single season (29, in 1905). For the three seasons from 1903 to 1905, Willis compiled a dismal record with the Boston Beaneaters of 42 wins against 72 losses. However, his ERA during those three years averaged 3.02 and in two of those years his ERA was under 3.00. Despite Willis' performance on the mound during those three seasons, the Boston offense could only muster a combined .238 batting average over those seasons. When he changed teams to the Pittsburg Pirates for 1906, whose offense had a combined batting average of .256 over the four years Willis was with the team, Willis compiled a record of 88–46. His ERA for those four years was 2.08. Willis was on one World Series championship team, the 1909 Pirates. He lost one game during the Series, pitching against Ty Cobb's Detroit Tigers. His final major league season was 1910, with the St. Louis Cardinals. Next season Willis pitched for a semipro team in his hometown Newark, Delaware. After retirement, Willis purchased and operated the Washington House, a hotel in his hometown of Newark, Delaware. Willis died in 1947 and is interred in St. John Cemetery in Newark, Delaware. The National Baseball Hall of Fame inducted Vic Willis in 1995, as the Delaware Sports Museum and Hall of Fame had done in 1977. He was the last pitcher to throw a no-hitter in the 19th century. ↑ Levitt, Dan. "Vic Willis". The Baseball Biography Project. The Society for American Baseball Research. Retrieved August 10, 2010. 1 2 3 "Vic Willis Statistics and History". Baseball-Reference.com. Sports Reference, LLC. Retrieved August 10, 2010. ↑ Lanctot, Neil (1994). Fair Dealing and Clean Playing: the Hilldale Club and the development of black professional baseball, 1910–1932. Jefferson, North Carolina: McFarland. p. 10. ISBN 0-89950-988-6.